Would you believe there is a fairytale town located in Portugal? Where there are colorful Moroccan-style castles, mysterious wells and gardens and a great fortress high up in the sky? I visited this fairytale town known as Sintra and it’s a must-see place to add to your holiday in Lisbon. Enjoying the view at the Moorish Castle! Sintra is a 45 minute train ride away from Lisbon. The tickets cost only a few euros one way. The easiest place to catch the train to Sintra is from Rossio station from where the trains go frequently. I used the Oriente station because it was more convenient for me. The easiest way to move around Sintra is by bus number 434 which costs 5 euros per ticket. With one ticket you can get to all of the main sights. The bus route is a circle and you can do one ride with one ticket but you can stop as many times as you wish along the way. Don’t make the mistake of trying to save money and go to the sights by foot if you have only one day for Sintra! There is a massive hill up to the sights and you will be exhausted even by wandering around the sights. The first sight with the bus is the Moorish castle. Don’t miss it! The castle sits on top of a high hill and has a stunning view over Sintra. I would describe Moorish castle as the Portuguese Great Wall of China. The paths in the castle are quite narrow and I would not recommend it to people with walking difficulties. If you have a fear of heights it is a perfect place to overcome the fear. I have a huge fear of heights and I think that my hand marks are now printed on the walls of the castle since I was holding on to that wall quite hard. I got to Sintra at 1 pm but I would suggest to go there earlier. 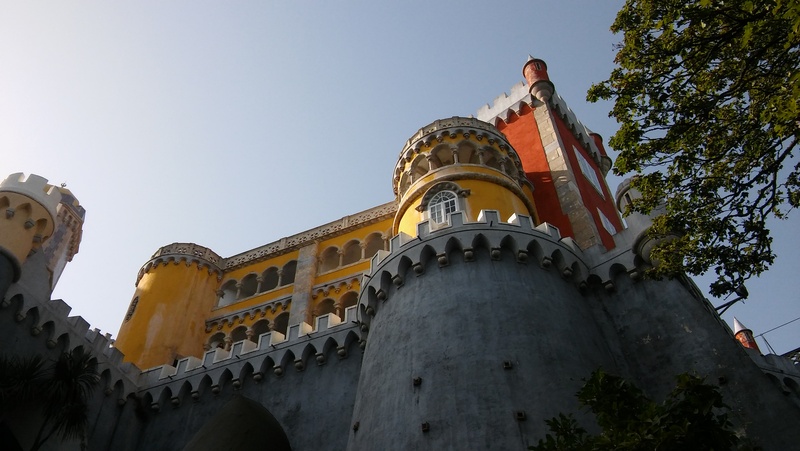 I left from Sintra around 7 pm after just visiting Moorish castle and the Palace of Pena. I could’ve spent many more hours wandering around the beautiful city of Sintra. If you have the chance, book an overnight stay and take all the time you need at each sight instead of running around like I did. This was only a scratch of what Sintra has to offer so go and explore this amazing town! Don’t forget to check out my Lisbon experience! This is must place for a visit when in Portugal. We loved it. I totally agree! Sintra is wonderful! That looks amazing! I’ll add it to my list! Sounds wonderful. One more city to add to the list.